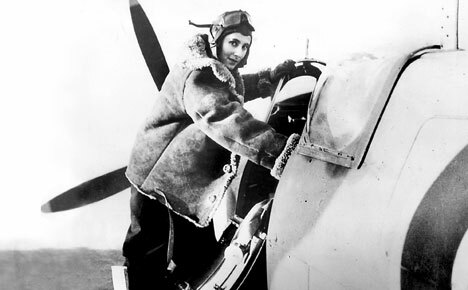 One of the prominent women pilots of the ATA, Mrs Diana Barnato-Walker climbs into the cockpit of a factory-fresh Spitfire Mk. IX. One of the prominent women pilots of the Air Transport Auxiliary, Mrs Diana Barnato-Walker climbs into the cockpit of a factory-fresh Spitfire Mk. IX. Diana Barnato was a daughter of a car racing millionaire Woolf Barnato, the chairman of Bentley Motors. From an early age she was interested in aircraft and at age of 20 become a succesful pilot. In early 1941 she became one of the first women pilots of the Air Transport Auxiliary (ATA), pioneering – not for the last time – a new path for women in aviation. The ATA service and further training permitted her to routinely fly high performance fighter aircraft such as Spitfires, Hurricanes, Mustangs, Tempests. Later, Diana also became eligible to fly twin-engined aircraft and delivered Whitleys, Blenheims, Mosquitos, Mitchells and Wellingtons, normally flying solo – and, as per ATA standards, ferrying aircraft in any weather without the aid of the radio or training in blind instrument flying. She also became the first women to deliver RAF aircraft to continental Europe after D-Day, in contradiction with the order of ACM Leigh-Mallory who expressely forbade ATA women pilots to perform such deliveries. In response Diana arranged a clever plot together with her husband, W/Cdr Derek Ronald Walker arragning for the “unofficial” delivery of two Spitfires over the Channel. As a result, the order was upheaved. After the war’s end, Diana continued to fly and gained commercial flying licence. In 1963, she became the first British woman to break the sound barrier, piloting an English Electric Lightning T4 to Mach 1.65. I met her long ago , in the fifties . I always thought she was so like Greta Garbo .